The IHE PCC Bed Management profile represents a departure from business as usual in the IHE PCC Technical Committee. It is neither a modern CDA based profile, nor a post-modern FHIR based profile. Instead, it returns us to working with the twentieth century HL7 Version 2 family of standards. Why? In this particular case they are widely implemented in the systems where Bed Management is important, they aren't broken, and they are quite sufficient to the use case. I just uploaded the draft version of the profile for our Volume 1 review next week, where most of the committee will be in Portugal meeting to go over the materials. I, alas will not be, as I have to be in Orlando suffering (#sarcasm) through a vacation with my family. The problem this profile attempts to address is to reduce patient wait times for beds when being transferred from the ED to the inpatient setting. While this profile may use ancient messaging technology, it does provide some support for modern 21st century analytics. By communicating early in the ED visit, the bed manager can make predictions about resource needs (both beds and staffing), an support appropriate measures in order to provide better care. In this profile the ADT Patient Registration system communicates patient demographics to the EDIS. The EDIS communicates patient status (potential need for a bed, patient acuity, movement, et cetera) to the bed manager so that it can apply predictive analytics to support resource allocation. The Order Placer is assumed to be a CPOE component by which the ED physician enters an admission order to the bed manager. 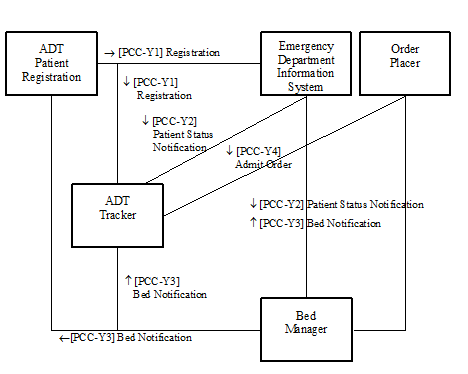 The Bed Manager communicates bed status to the EDIS and ADT Patient Registration system. Finally, the ADT Tracker support tracking of activity so that facilities can create dashboards, digital bed boards, and capture measures of quality (e.g., time between order to admit and patient transfer from the ED) to support better management of facility resources. I'll be working in the pre-park (Universal) morning with the IHE PCC Technical Committee whilst on vacation in order to keep up with reviews of this profile. While I'll miss most of the fun, I'll at least be able to keep up with my work on this particular item. Unfortunately, I cannot be in two places at once, and as beckoning as a trip to Portugal sounds, a week playing with my family will still win every time.